My little darlings are both in showbiz, which often sees me poring over tour schedules, trying to match up cheap flights, affordable accommodation and nearby parkruns. It’s very rare that they are in the same place at the same time, but this year, on my birthday, all the stars seemed to align! Storm Callum arrived. My Friday morning flight had been due to take off at 8.30 am, and Jemima’s show was in Coventry at 7 pm. I’d been saying all week I could cope with a delay of several hours. But FlyBe made the decision to cancel all their morning departures from Belfast City airport, leaving me in a bit of a panic, booking alternatives. (To be fair to FlyBe, propeller planes do not take kindly to the gale force winds that we were subjected to). So EasyJet to the rescue, from the much maligned Belfast International. Check in and security were all very smooth, and I caught a train from Birmingham International straight to Coventry with no problems. Saw Jemima’s show, i-Infinite that evening, and was ready for my Saturday morning parkrun fix. I was staying at the Ibis hotel close to the station, which was an easy 15 minute stroll to War Memorial park. There are a number of buses which pass by, and a decent sized car park. I was there well before 8.30, but already the team of volunteers was setting up (and storm Callum wasn’t helping them keep the cones in place!). This is a large parkrun, so a small army of volunteers is needed. They were very friendly and welcoming, and pointed me in the direction of the loos, in a very smart looking building. Loos are clean and warm, and are opened about 8.30. I got chatting in the queue to a local student, and also the tail-walker/ first-timers-briefer for today. This is also the cafe where runners meet afterwards for cake and conversation, and where I enjoyed a bacon butty and cup of tea for under £5. 2 and a bit laps around the beautiful park. In October when I visited the trees were looking stunning in their autumnal splendour, but causing quite a bit of twigs and seed cases on the ground. It’s mostly tarmac all the way, not totally flat, but with cheery and encouraging marshalls at various points ringing bells and calling out “keep smiling!”. There’s a finish funnel, so keep in order and keep moving. Scanning takes place up by the cafe. It’s a University town, so expect a good few speedy twenty-somethings. The start has signs for you to line up based on your expected finish time, which does make for a smoother and less bottle-necked first 200m. There were also a couple of dogs and prams, and a wide age range from under 10s to….ahem, people even older than me. Numbers are usually around 600. I’d forgotten to bring any sort of waist belt or pouch! When I’m running with Minnie there is a zippy pocket on the running belt, and I always have something to transport poo bags and treats. So I had to be inventive – I tucked some money and my hotel key into my wristband/ sweatband, and shoved my phone into my sports bra. My Garmin and headphones worked perfectly. I wore my black 100 shirt, and my cow cowl, which was recognised by fellow tourist Beth, though this is her local run. Ugh, 35 minutes. But you know what? It doesn’t matter. and we met for a lovely lunch at Cherry Reds cafe. Service a bit slow, but funky and fabulous food. Motown the Musical is a non-stop feel good megamix of hits – guaranteed to leave you smiling. And a busy show for Harry as Head of Automation, lots going on all the time. I caught a train back to the airport station, my goodness this is a big airport! I’d had to get on the phone to FlyBe earlier, since if you don’t take your outward flight they automatically cancel your return leg. But my 8 pm flight was very hassle free, and I was back home at 9.30 pm. That was certainly a fun packed couple of days, and a birthday to remember. Welll… I’d said it was probably the toughest year of my life. And possibly also the best. Here’s a photo montage of some of the highlights. The Gambia, Calum’s Road, leaving in January in heavy snow, heavy laden bike, The Butcher’s Shop restaurant (where we got food poisoning), and a return to the original road on Raasay. Severe weather conditions, but spring arriving! Volcanic ash disruption, and alternative ways home. Prince Charles waving to me, and Meet the Meat. 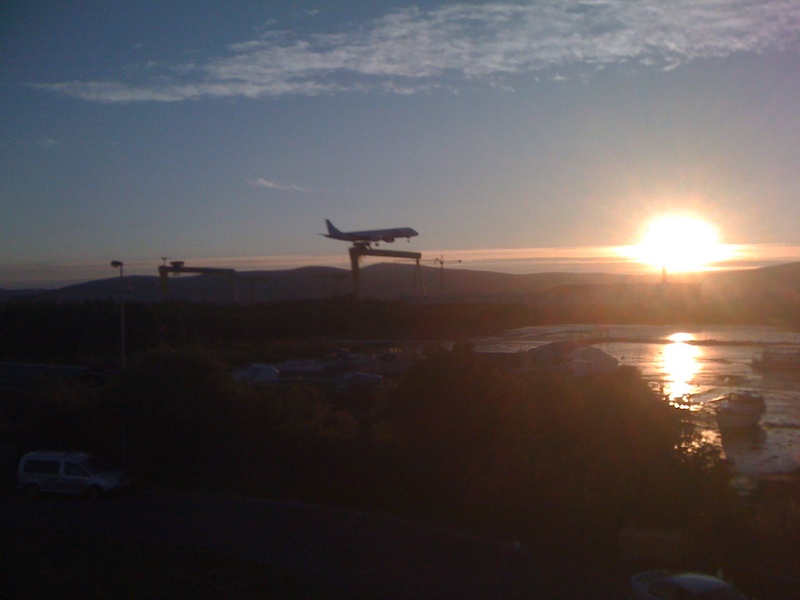 New abode – planes trains and automobiles. Bad bananas and mad dogs. Parking fine and flat tyre. Major work to the Beahive – shed, bathroom, boiler, furniture from IKEA, where I’m now on first name terms with the staff. The many aspects of me – new hair, new bag, my Trilogettes, dressing up as Doc for a Back-to-the-future-a-thon, Beatrix, working out measurements in the Numbers room, balloons, bingo by the pool, dancing with Chris Hollins….and getting engaged! I’ve ended the year 1/2 a stone lighter than I began, and I hope 2011 will be as full of adventure and fun ! Last Saturday, having a bare necessities of a working loo and a fridge, I slept in the new house for the first time. So I’ve been here now one whole week. The to-do list has shortened from eleventy-million items to a mere handful, and I’ve slept really well every night – despite the noise from the nearby planes trains and automobiles! But trains only run between 6 and 11, and planes between 6.30 and 10, so the only continuous noise is the traffic on the bypass, which is distant enough and constant enough to be almost a white noise background. The most striking thing is how quickly I felt at home here. OK, I’ve lived in lots of different places, but I’ve lived in Belfast longer than anywhere else – East Belfast in particular. I love being so close to shops, that an Indian takeaway can find the address easily, that I can just walk across the footbridge to Victoria Park, that I can see the sunset from my back garden. I’ll apologize in advance for the self-indulgent and wallowing nature of this blogpost. I know I’m peri-menopausal, and I can feel a bout of depression about to descend. And I feel myself yearning for things I know I cannot have. Affordable, certainly, but impractical without any Max-factor. And yet I so want to view it. Again, impractical, but I want it. And I’m toying with some faux self-analysis – why do I want these things? Do I only think I want them? Am I mourning the fact that children and dogs are compromising my choices? Why do I need a wow-factor in my life..sorry..possessions? Am I that shallow? I suspect that living alone will precipitate more of these navel gazing type considerations. But for now, I’m going to go view that apartment. No harm in looking! After Thursday, everything could change. Firstly, Jem has her audition with Doreen Bird College. She quite likes Bird, having attended a course there last Easter and being awarded the certificate for Hardest Working Student. But just getting a place isn’t enough: without a Dance and Drama Award (DADA) there’s no way we could afford it. Even with a DADA it would be tough – living costs in London are eye-wateringly expensive, and as this would be higher education, not further education, she wouldn’t be able to get a student loan. So all costs have to be funded real time. The plus side is that when she qualifies she wouldn’t have a student loan to pay off. I still feel that at barely 17, which she’d be in September, she’s too young to go off to London on her own. And she’s quite amenable to waiting for another year. 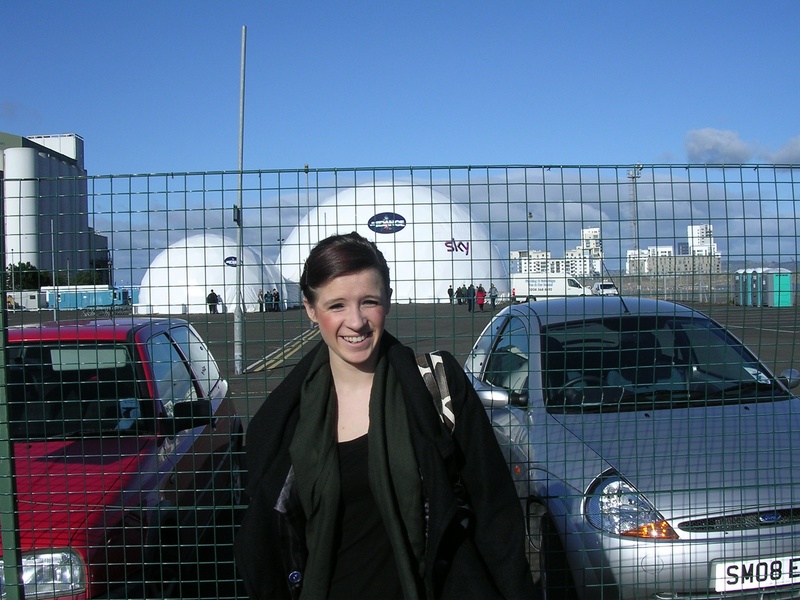 Her bf has 2 more years to do at Uni here, and she could start her Diploma at Belfast Metropolitan College, which has a good reputation for dance, particularly contemporary. At exactly the same time as her audition, Rog has a hospital appointment to look at his heart. If you were making a movie of my life, you’d be doing cut-away shots between the both. I know he’s very anxious about this, and what it might mean. Though I do think that anyone really worried about their heart should have an incentive to stop smoking. Anyhoo, concerns about his future are making it awkward for us to discuss our future. Having lived apart now for nearly 4 months, I prefer it this way, so if I’m going to find somewhere new to live I’d really like to start planning that sooner rather than later. Though I suppose it could wait till we find out the result of J’s audition. And it’s no surprise that I’m writing this in the middle of the night! A friend had been admiring the pictures of my new flat BEFORE I’d moved in, and had asked if it was still that tidy. Well here’s how it looks this evening. I think I taught myself to look at untidiness a different way when the kids were younger – instead of seeing mess, I chose to see evidence of painting, homeworks, reading, music making etc. 1. Lovely tasty lemony olives as snacking material while I cook. 2. A Stig soap on a rope – bargain at the supermarket, early birthday present for Harry. Stig themed presents are a long standing joke. 3. Dance Direct catalogue – for Jem and I to pore over all the lovely leotards. Next audition for Bird College in April. Booked cheapo Ryanair flights today – under £90 for 3 of us. 4. Champagne – to take to my sister’s tomorrow for my niece’s birthday, where my parents will also be. Sis is now a short bus ride away. 5. Cardboard boxes for when I move on again! This place is a 6 month rent. which gives me time to sort out what the future holds, and do some unhurried property hunting. 6. Chief, our cuddly dog. One of Matty’s presents to Jem – soppy gits the pair of them! It’s no substitute for Max, but he’s quite nice to cuddle up to of an evening. Without a TV we watch quite a few DVDs together, which is so lovely, even if its only on a teeny pink portable set. 8. The balcony. Well, it’s what estate agents call a “Juliet balcony”, meaning it’s patio doors with railings, but no actual outdoor space. Having said that, I did open the doors this evening to enjoy the dusk falling through the trees, while I enjoyed a chilled white wine leaning on the blacony rails. We’ve been here a month now, and it’s just so stress-free. 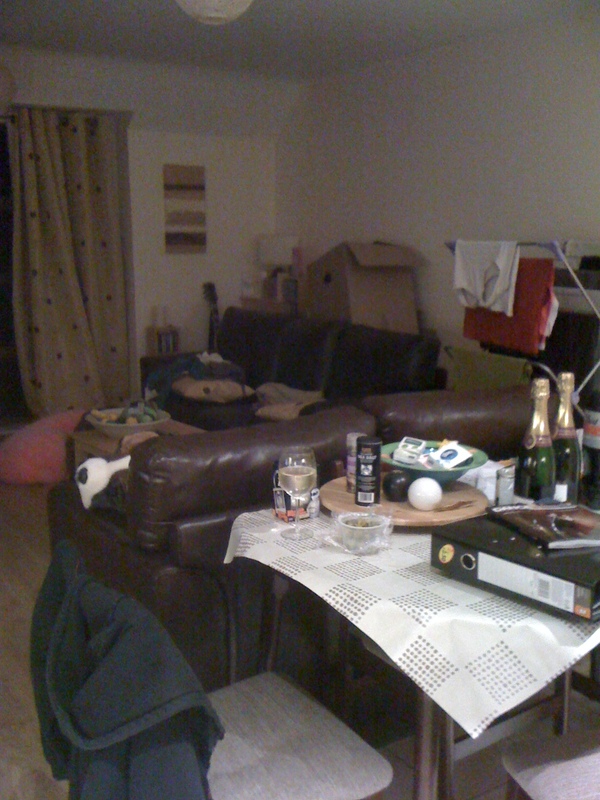 Jem, Matty and I all get on really well together, and no-body’s overly bothered by the odd bit of mess. I’m re-learning how to cook for myself, so shopping trips aren’t totally smooth yet, but we’re getting there. Jem seems to live on cheese, bread, ham, bacon, potato waffles, pasta and tomato sauce. Could be worse, I guess! Have just asked them what they think.